from long sought World 8-Ball title. Talk about bad breaks. In the final of the World 8-Ball Championship, with his five-game lead whittled to 10-9, Ralf Souquet studied the rack for a moment in preparation for his break, returned to his chair - and then sank right through the seat and almost to the floor. Trapped in the chair's broken frame, Souquet looked like the victim of a cartoon prank, with his rear end two feet lower than normal and his feet pointing to the ceiling. Momentarily discombobulated, Souquet struggled to extricate himself. The bigger question was how his balky back and usually unshakeable concentration would react to the setback. "At first, it was more of a shock because it came unexpected, but after a minute it started to hurt as well," Souquet said. "It wasn't super-bad, but I felt it on almost every shot thereafter, and my focus was a bit off." But Souquet has been around long enough to know that 8-ball is a game of breaks - good and bad - and he took advantage of each that came his way. At 10-9, he broke and ran out. In the next rack, he took advantage of a missed kiss on the 8 ball by opponent Ronnie Alcano to increase his lead to 12-9. He sank a ball on his final break and cleared the solids for the 13-9 victory and $60,000 title. Souquet earned a measure of revenge over Alcano at the Damas 2008 WPA World 8-Ball Championship, staged April 18-25 at the Fujairah Exhibition Centre in the United Arab Emirates. But he claimed that his 17-11 loss to the Filipino in the 9-ball final of the 2006 World Pool Championship carried little motivational weight. "I didn't really see this match as revenge, because it was a different discipline," he said. "I just wanted to show the world that 8-ball is my favorite and probably best overall game. I have dominated the European 8-ball championships for a good decade, but never had a good roll in the Worlds. 8-Ball can be cruel sometimes, and I have realized that not always the best player will win." At the World 8-Ball Championship, he did. Souquet didn't miss a ball in the final. Sometimes you make your own breaks. Players from 32 countries filled the field of 64 at the Championship, including the winner and runner-up from 2007 - Alcano and Filipino countryman Dennis Orcollo, respectively. They were joined by several strong contenders, including two recent world 9-ball titlists - reigning champ Daryl Peach (England), and 2005 winner Wu Chia-Ching (Taiwan). Also casting long shadows were England's versatile Darren Appleton; Sweden's Marcus Chamat; and America's hot-as-lava Shane Van Boening. But for pure 8-ball pedigree, you couldn't beat Souquet. Over the course of his presumed Hall-of-Fame career, the 39-year-old German had collected an unmatched ten 8-ball titles at the European Pool Championships. 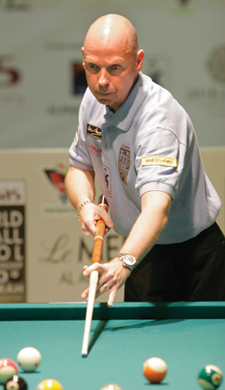 After the International Pool Tour's two multi-million dollar 8-ball events in 2006, "The Kaiser" was ranked seventh out of 150 regular tour members. It has long been Souquet's dream to don a world 8-ball crown. But at the three previous World 8-Ball Championship events sanctioned by the World Pool-Billiard Association, Souquet stalled at ninth place - including a hill-hill heartbreaker to Peach in 2005 after snookering himself in the last rack. So Souquet must have felt his heart sink while watching perhaps the most ferocious and demonstrative breaker on the planet repeatedly shatter the racks and run out in their first-round match in Fujairah. High-kicking Jeff De Luna of the Philippines bounded to an 8-5 victory over Souquet, putting the German one match from elimination. In the first stage of the event, players were divided into eight groups of eight for double-elimination play. Souquet salvaged the stage by winning his next two contests, 8-1 over Amine Ouahbu of Morocco, and 8-6 over Malaysia's Ibrahim Bin Amir. The top four players in each group passed through to the field of 32 for single-elimination play. Attention shifted squarely to two points of focus - defending champion Alcano and Austria's Jasmin Ouschan, the lone female in the field. Ouschan, 22, earned a spot among the 32 with a scintillating shot in her final rack against Appleton in the last round of the group stage. With one ball in her suit remaining, she banked it off the rail, kissing it off one of Appleton's balls and into the corner pocket. One 8 ball later, she was the 8-6 victor. Ouschan was on the verge of reaching the round-of-16, leading 9-7 against Marcus Weston of Germany. But a missed ball allowed Weston to run out, 9-8. Ouschan's dry break in the next rack and Weston's break-and-run in the case game allowed him to escape with a 10-9 win. "That was a painful defeat, and I was disappointed in myself and my performance," Ouschan said. "That's the way it goes sometimes. ... I had a huge chance to finish at least ninth, and that would have been sensational for me. But what is also important is that when I watched the performances of the top men in this event, I saw so many things that I have to work on in the future."